The “No lokum for massacres” banner that started it all. 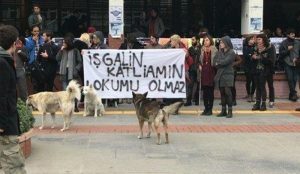 Note from the editors: In the week following a non-violent demonstration on the campus of Boğaziçi University in Istanbul against a pro-government Islamist student group handing out sweets to celebrate the victory of the Turkish Army and its allied militias in the Syrian-Kurdish district of Afrin, Turkish police have repeatedly swept into the campus in pursuit of anyone suspected of involvement in the anti-war action. The ongoing wave of detentions on the Boğaziçi campus form part of a strategy familiar from earlier police action on university campuses in Turkey, and which intensified even before the President and his cabinet began effectively ruling by decree under the state of emergency in place since summer 2016. In line with official policy guidelines that universities must be made first and foremost “centers for national unity,” the police purport to defend pro-government students’ right to political expression by removing those with opposing viewpoints from campus and revoking their right to an education. Turkey’s entrance into the ground war in northern Syria is a prime occasion to apply this tactic, just as this war—and war in general—quickly becomes an engine for stamping out dissent. While eleven were arrested on Thursday, March 22nd, since then many more student activists, even completely unrelated to the protests, have been detained or at least harassed. A typical scenario involves shoving the student into a car, terrorizing them, and then abandoning them in the middle of nowhere. A petition of international support for them has been circulating over the past week. In what follows, we interview some of the students involved in the initial confrontation and ask ourselves what we can do, from a distance, to offer concrete and meaningful solidarity. On March 19, after Turkish forces captured the city of Afrin, Islamists at Boğaziçi University distributed lokum (a well-known sweet known internationally as Turkish Delight), without the permission of the university administration, in order to celebrate the occupation. Some anti-war students gathered demanding that this stop, since it meant support for the violations of the Turkish state. The banners they held were titled: “No Turkish Delight for Occupation and Massacre,” “The Palace Wants Wars, the People Demand Peace” and “Jihadist FSA, Collaborator AKP”. Then the supporters of both sides came and there was suddenly a huge crowd. The plain-clothes policemen were also there with their cameras, while the Islamists shot videos as well. There was no physical confrontation at all and after hours of arguments, upon the reconciliation efforts of the university administration, members of BİSAK, the Boğaziçi University Islamic Research Club, agreed to leave the university. It is important to note that the university allowed them to form a student club years ago in order to include them in the liberal culture of the university. This liberal institutional culture allowed women with headscarves to enter the university even when the laws prohibited this, which they no longer do. So that is another reason why the students of Boğaziçi are angry with the Islamists: they used democracy and freedom of speech to grow stronger but they want these values only for themselves. Police detained three students after the whole thing, for their small discussion with Islamists, and released them two hours later. We thought that was it. Yet, that evening they shared the videos and started a campaign arguing, “we don’t want terrorists in universities.” On March 20 there was an Islamist group chanting Allahü Ekber, trying to get into the university to “find the terrorists” who had prevented others from distributing turkish Delight. Also, Turkish nationalists filled the whole campus with Turkish flags and celebratory banners. We understood it was a planned thing and warned each other not to interfere. It was a quiet day for us, but there were Turkish TV channels and newspapers, which are pro-government of course. That day, the videos served in the news showing the faces of the protesters. Wednesday was also silent for us, we thought it was over. Not much happened on campus. The following night (March 22) the police raided houses and dorms at 5 a.m. and detained seven people, including three who were not even in the protest. The police even insulted, kicked and slapped us for men and women staying together. Three people were released afterwards. The next day (Thursday) hundreds of students gathered to protest the detention of their friends. Police openly told us that if we started to chant, they would detain us. Students did not step back and they detained five of us really violently. They broke somebody’s nose for example, as we started to chant. 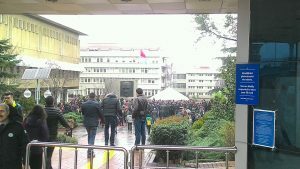 For the first time in this millenium, riot police entered our university, which is known to be the most liberal and free university in Turkey. That day Erdoğan said that they would find these terrorist students using security cameras, he also said that any academic who had any “coherence” with them would also be punished. Then I realized that the whole thing is also about the trials on March 28, which are already next week. 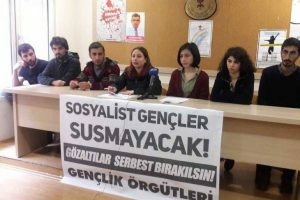 The “Academics for Peace” have to be in front of the court for their declaration in January 2016, criticizing the Turkish army’s offensive in Kurdish cities titled “We will not be a party to this crime”. More than a thousand academics signed it in Turkey, many from respectable universities like Boğaziçi University. So Erdogan has tried to undermine the support behind the university by arguing that the students are terrorists and the academics are backing these terrorist students. The government media has especially targeted the peace protesters’ emphasis on the occupation and the massacres of the Turkish army. On Friday two other students were detained around the campus. Police said both of them were wanted, but they were not actually on the list given to campus security and the university administration. We think they identified them from security cameras after the raids. Authorities say that their testimonies will be taken on Monday like others’. So it is still an ongoing topic? Yes, on Saturday evening Erdoğan argued that these “communist, traitor youth” tried to mess up a student stand opened by “religious, nationalist, local youth” at the public Boğaziçi University. Erdoğan announced an investigation and said, “we won’t give these terrorist youth the right to study at these universities.” Following his orders on Sunday at 6 a.m. there was another house raid, two detained from their houses and one from the university dorm. Erdoğan also declared that this operation would continue until all of those terrorists were found. So a new wave of detentions is expected. How would you describe the general situation at the university now? The daily life around the university is radically changed now. Students who took part in the protest are afraid to spend time outside. The police are all around the university and the university neighborhood, checking identities in the bars, cafes, metro exits and even within the library. So it is non-stop harassment for us. Of course it is also an attempt to intimidate the anti-war people of Turkey for possible future military campaigns in Iraq and Syria’s Kurdish-controlled territories. How can people support you from outside? People have influence over their governments, they can push their government to take real actions against Turkey’s aggression and violations. They criticize but continue to do business, sell arms etc. ; it is a hypocritical stance. They should understand a reconciliation is not possible. Appeasement policies towards dictatorships proved to be disastrous historically. Also the people can show solidarity with Kurdish organizations. Simply, the Kurdish movement is the real hope in the Middle East, if they are betrayed by the progressives, the future of the Middle East will be darker, which will of course affect other parts of the world. This is a more general way to help. Specifically for this issue, people can find local ways to protest Turkish officials. They can let others know and care about what is going on here. Most vital of them all, there are lots of politically active people who have lost their jobs because of emergency decrees. There should be solidarity networks, especially among students. There are lots of Turkish dissident students in Europe who will be arrested if they ever return to Turkey. Lots of them escaped from Turkey because of arrest warrants. They are in need of financial, psychological and social help. For us, if we ever have to leave this country (we hate this possibility) we want to know there are other countries welcoming us, which did the best to support us inside and outside Turkey. Otherwise we will feel betrayed and feel that all we did was for nothing.